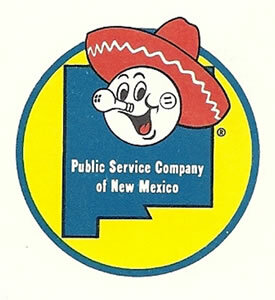 I posted the above logo on my Facebook page, 'Albuquerque Memories' this week and was surprised that out of all the photos posted showing my home town over the years, how many shares and likes and comments this one brought. As a kid we saw this on the backs of milk cartons, mom's cookbooks and on the 'tuit' handed out at the State Fair. That was one of those rubber things you used to get the lid off a stubborn jar. What great marketing back then that nearly 50 years later has stuck with many. Turns out Reddy Kilowatt is a branding character that acted as corporate spokesman for electricity generation in the United States and other countries for over seven decades. The above logo was slightly changed for regions. In Texas he wore a Cowboy hat, back East and out West a Hardhat. I wonder what logo or branding kids today will remember 50 years from now? Whomever came up with Reddy Kilowatt must be looking down from Heaven with a proud smile.